THE LATEST POLITICAL opinion poll shows an increase in support for Labour, with backing for Fine Gael also holding steady. 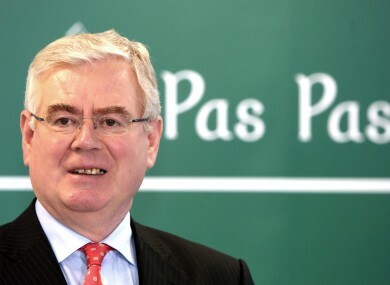 The Sunday Business Post/Red C survey shows Tánaiste Eamon Gilmore’s party on 12 per cent — a rise of three points on the last SBP poll four weeks ago. Fine Gael is on 29 per cent, showing no change from the last survey. On the opposition benches, Fianna Fáil is down by one point to 22 per cent, while Sinn Féin is also down: dropping two points to 15. Independents and others are on 22 per cent (no change). Meanwhile, more than half of those questioned said the Government had done a good job in leading the country out of the EU/IMF bailout. This weekend’s poll results will provide a political boost to Eamon Gilmore ahead of his party’s conference in Kerry next weekend. Labour support has been flagging recently: an Irish Times survey at the start of October put the junior coalition party on just 6 per cent, representing a 25-year low. Email “Good news for Labour in new opinion poll, FF and SF both down”. Feedback on “Good news for Labour in new opinion poll, FF and SF both down”.